The 1st motion controller designed for PlayStation VR. Experience full freedom of movement powered by your feet in more than 30 compatible games at launch. The 3dRudder for PlayStation VR grants you full motion control. Pilot with your feet and give your hands double the power: your hands are free to shoot, hit, grab objects, change weapons. The 3dRudder for PlayStation VR was specifically designed to enhance your motion experience on PlayStation VR. The 3dRudder for PlayStation VR lets you move freely and seamlessly in compatible games. Speed-up, slow down, stop when you chose to and go exactly where you want to. Pilot with your feet and keep your hands free to shoot, hit, grab objects, change weapons and display menus. The 3dRudder for PlayStation VR will be compatible with more than 30 PlayStation VR games at launch. Here is a selection of games, already released or coming in 2019, that will offer native support for the 3dRudder on PlayStation VR. More will be added until the official launch. Visit this page regularly for new compatible games. 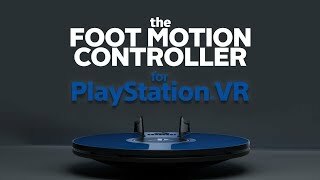 The 3dRudder for PlayStation VR is a foot motion controller used seated. It offers full freedom of movement in compatible games. While you pilot with your feet, you free up your hands for other actions: you can shoot, hit, grab objects, change weapons. On top of enhancing your gaming experience in compatible games, the 3dRudder for PlayStation VR grants you full motion control: you run the game at all times! The 3dRudder for PlayStation VR is the winner of a CES Innovation Award in the virtual Reality category for 2019. Plug & Play: get started in a few seconds. Plug your 3dRudder in the PlayStation 4, launch a compatible game, put your feet on the 3dRudder & start playing! N/A. Plug the 3dRudder in your PlayStation 4 & play.